Chris Taylor and Abigail Taylor of OTS inspecting a new 100t WaterLoad bag at the Seaflex Cowes, UK factory, during training in late September 2017. 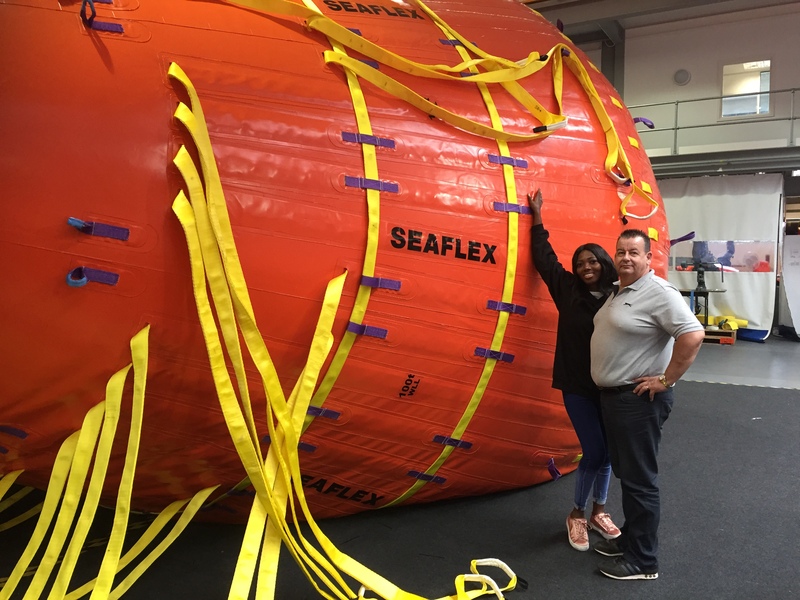 Seaflex waterbags now stocked in Takoradi, Ghana to service local demand for the testing of cranes, lifeboats, gangways and other load-bearing structures. The new service centre supplements the existing African sales, rental & service facility within Unique Group’s Hydra factory in Cape Town, offering closer support to customers in the Gulf of Guinea. Customers who prefer to purchase than to hire Seaflex waterbags and buoyancy bags are guaranteed convenient local through-life servicing support from both African bases. Unique Group’s Buoyancy & Ballast division welcomes Offshore Technical Solutions (OTS) of Accra and Takoradi to the Seaflex brand’s international network. Seaflex WaterLoad™ bags and Seaflex-trained service technicians are now deployed at the OTS Takoradi base, serving the Ghanaian market as well as neighbouring countries. With a track record spanning nearly 20 years and taking in many of the biggest worldwide names in lifting, load-testing and inspection, the Seaflex WaterLoad™ range of crane testing weights comes in a range of capacities from 1t to 100t – enabling them to be used singly or in clusters of up to 300t from a single hook. OTS offers the rental of Seaflex WaterLoad™ bags up to 35t, as well as the sale and subsequent local support of Seaflex waterbags in every size, up to the new and market-leading 100t WaterLoad™. The equipment servicing standard in this location is as consistently high as all bases in the Seaflex network. Every waterbag is thoroughly inspected and tested between each rental by trained technicians, assuring users that the bags perform their required purpose straight out of the crate; the first time, every time. Additionally, OTS undertakes first-line servicing and repair work to factory standards on any Seaflex buoyancy bags previously supplied into Ghana and the wider West African region. OTS also offer this service to any customers within the region who may rent or purchase Seaflex modules in the future. The full list of Seaflex global service centres can be viewed here.